Pear Ice Cream - Do You Know The Muffin Man? 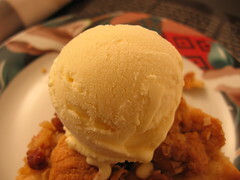 Notes: The fresh Bartlett pears for this ice cream are briefly heated for a minutes. According to the authors, this destroys an enzyme which causes browning, even over time in the freezer. For some reason, my pears were still quite firm and not very sweet after sitting on the counter for over a week. I heated them in the pan but they still turned a bit brown. Anyway, this ice cream was delicious, smooth, creamy with a subtle but unmistakable pear taste.